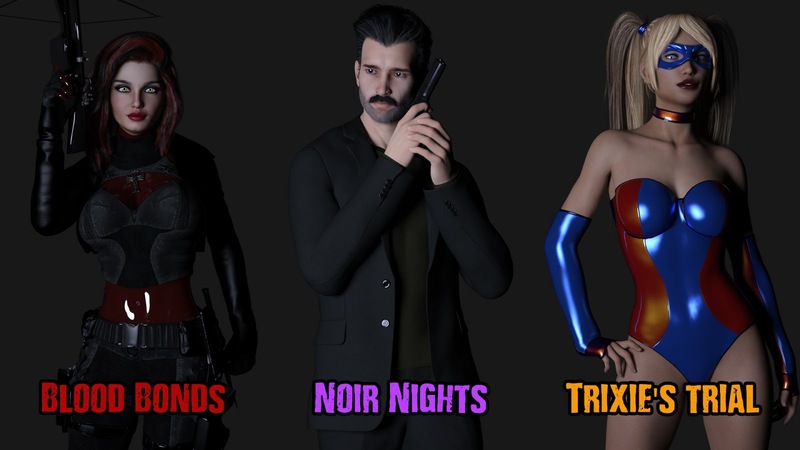 My Patrons just got the new release of D:BB, and everything before this is public for free! Head out and enjoy some dark erotica! Announcing plans for a new Slugs and Bugs game! Check out the video and let me know what you think! Just a head's up my $5 and up patrons have access to the giant new update to my next interactive novel, Desideratum: Blood Bonds! From now on, the titles no longer go down until released a month later. Now, the public will always be an update (or possibly 2) behind my patrons. If you want to check it out, please support me for the price of a value meal at a fast food place, and thank you! Cereborg: Inception is finished! I have completed yet another massive project. You will need to start a new game, it won't work with the old saves, and it is FREE for everyone! I hope you enjoy it! Work has already begun on my next project,m Desideratum: Blood Bonds, so consider investing in my patreon! 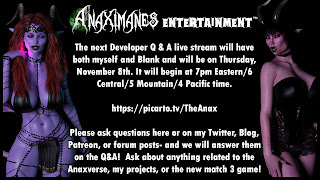 The next Developer Q & A live stream will have both myself and Blank and will be on Thursday, November 8th. It will begin at 7pm Eastern/6 Central/5 Mountain/4 Pacific time. Please ask questions here or on my Twitter, Blog, Patreon, or forum posts- and we will answer them on the Q&A! 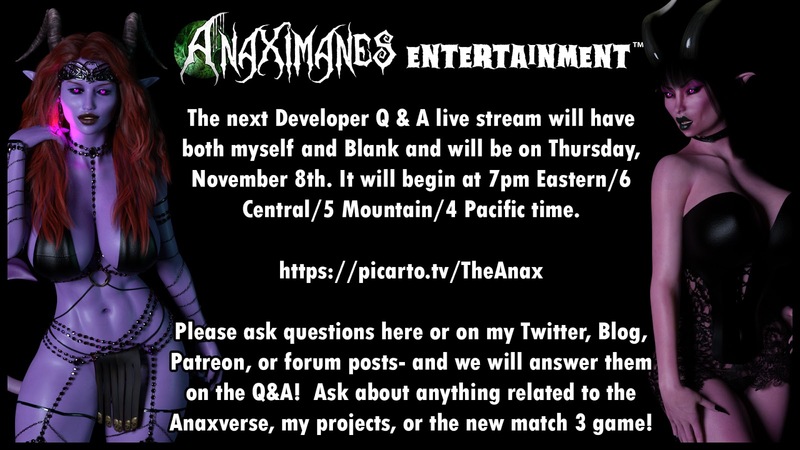 Ask about anything related to the Anaxverse, my projects, or the new match 3 game! 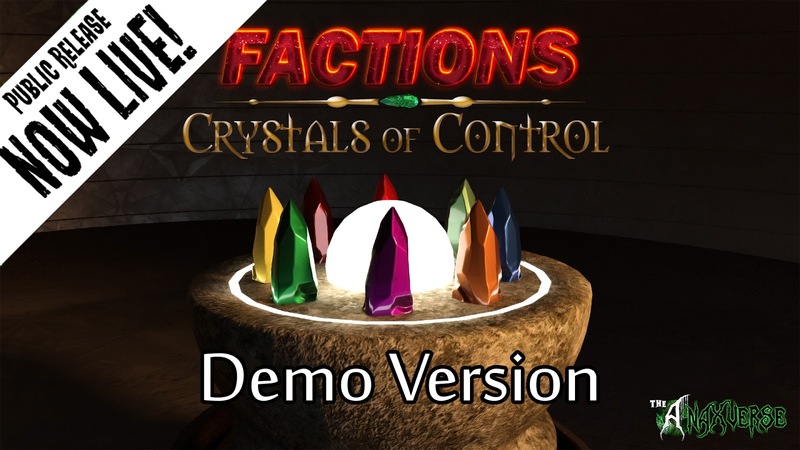 Factions" Crystals of Control Demo is now public! If you want to try out the demo, proof of concept version of my match three game, then please download and try it out! My $5 patrons and up have been voting, but only 65 have done so! Right now, it is a very close race between Desideratum and Giggle Night! 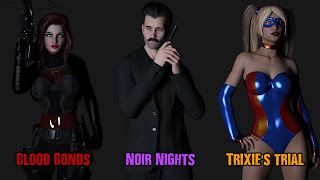 But, as we have seen before, Noir Nights could suddenly spring up at the end to win. If you invest $5 or more in my Patreon, please vote! Or, please consider supporting your hard working bogeyman and help choose the next novel! Which project shall I do next? The polls are open! Which title will my patrons choose for us to enjoy next? Who can say? It is always surprising! So, if you have not considered investing in me, now would be an ideal time, as for a mere $5 you could help shape the next few months of entertainment! $30 Patrons have the factions demo! I have also released the announcement on YouTube, explaining, finally, the play control and concept of Factions: Crystals of Control! So, take a look and see what you think!